The new standard for towbar mounted cycle carriers, for up to 4 (3) cycles. Suitable for most vehicles without a spare wheel on the back(4). No special or awkward adaptors are required for 4×4 vehicles with rear mounted spare wheels – just choose the carrier to suit your vehicle(4). Both the main column and carrier arms are made of heavy dusty section steel allowing a carrying capacity up to 65kg(1). 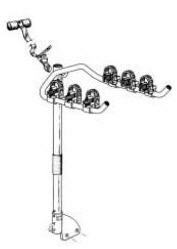 Clamps are available to upgrade existing cycle carriers, part number ZX98/S. Complete with 3 pairs of cycle attachment clamps and a “bungee” cord with hooks to secure wheels. Several models will soon be available covering the majority of popular vehicles – including those with rear door mounted spare wheels. Note – A suitable cycle carrier lighting board should be used if the number plates or lights are obscured when the cycles are fitted. 1) The recommended maximum noseload of the vehicle must not be exceeded. (2) After initial installation of lower support bracket. (3) Depending on the size and the type of cycles. 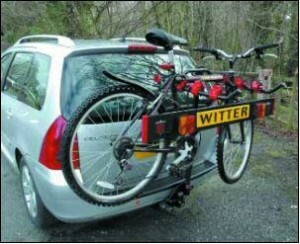 The number of cycles carried when towing is dependant on the length of trailer/caravan A frame, position of jockey wheel and brake handle, and size and the type of cycles. The user is responsible for ensuring that there is sufficient clearance to avoid contact between the cycles and trailer/caravan. (4) Soon to be introduced.